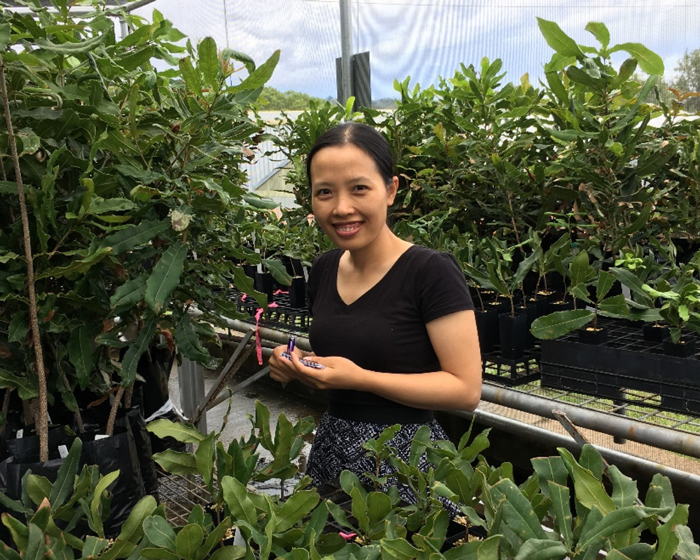 I am a first year PhD student at The University of Queensland (UQ) and am working with the macadamia breeding program of Queensland Alliance for Agriculture and Food Innovation (QAAFI), UQ. Before commencing my research at UQ, I was working at the Department of Molecular Biology, which belongs to Vietnamese Academy of Forest Science since 2008, where I managed and participated in projects related to apply molecular tools for forest tree breeding improvement such as Eucalyptus, Pinus, Acacia, ect. I’ve also completed my Master of Biotechnology at UQ in 2013 with a small project on analysis relationship between Macadamia and wild relatives based on the whole chloroplast genome sequence. Macadamia is an iconic Australian genus, being the only international crop domesticated from Australian flora, the macadamia nut is widely recognised as the world’s premium nut. There are four known macadamia species, but only two of them (Macadamia integrifolia and M. tetraphylla) are used to produce commercial crop for their edible nuts while two other relatives (M. ternifolia and M. jansenii) has inedible nuts due to containing high levels of cyanogenic glucoside. The genetic improvement program of macadamia mainly utilized only a narrow genetic pool of M. integrifolia and M. tetraphylla. A large amount of wild macadamia genepool remains unutilized and we’re seeking further opportunities. My PhD project will be conducting research on wild macadamia germplasm, which were collected by the National Macadamia Germplasm Conservation Project (MC99029) and planted in 2000 – 2001 in three different sites: Alstonville (New South Wales), Caboolture and Tiaro (Queensland), and included all four macadamia species and their hybrids. In this project, I aim to utilize the wild gene pool in Australian macadamia breeding program using trait genomic study. Initially, I will be characterizing all the macadamia species (Macadamia integrifolia, M. tetraphylla, M. ternifolia and M. jansenii) for morphological and biochemical traits that are associated with production efficiency and human health respectively. I will be phenotyping for growth and reproductive traits to identify a new source of reduced plant size and increased yield. My second aim is to identify genomic regions conferring the useful traits using high throughput molecular marker and sequencing technology. My final aim is to develop interspecific hybrids, which we can utilize in next generation breeding programs. The outcome of the trait characterization study can be used for planning future macadamia breeding for target traits. Identification of markers associated with traits can be utilized to accelerate future macadamia breeding programs through marker assisted selection. Interspecific hybrids developed through my PhD study will be used as progeny of current breeding program.